1) Pour a cup of boiling water over your dried mushrooms to hydrate them. 2) Chop the fresh mushrooms and mix with some fresh thyme and sage. Cook them in olive oil with salt and pepper until browned and they have released some of their water. I like to finish the mushrooms with a knob of butter. Put these to the side. 3) Chop the rehydrated mushrooms and reserve the liquid as well. Put both of these aside. 4) Chop an onion into a fine dice. Put your 6 cups of broth on the burner to heat up. 5) Sweat off your onion with the butter and olive oil until they become translucent. Stir in your chopped rehydrated mushrooms and the rice. Coat the rice in the onions and oil and toast for about 5 minutes on medium-low heat. 6) Add the reserved mushroom broth and white wine and stir until it has absorbed. Then you can start adding your hot stock in, about a cup at a time. 7) Keep adding stock 1 cup at a time until it absorbs, about 5 times. Taste the rice to see how it is cooking. You want the grains to be plump but not breaking apart but not too hard to chew/too starchy. When you use a wooden spoon to scrape a line through your risotto and you can see the bottom of the pot, note how long it takes the risotto to move. If there isn’t too much liquid, that means the rice has absorbed your stock and it’s ready for another cup. 8) Once you have added all your stock and you are happy with the texture of the rice, add half of your cooked brown mushrooms and adjust for seasoning. Add some of your microplaned cheese to your own taste. 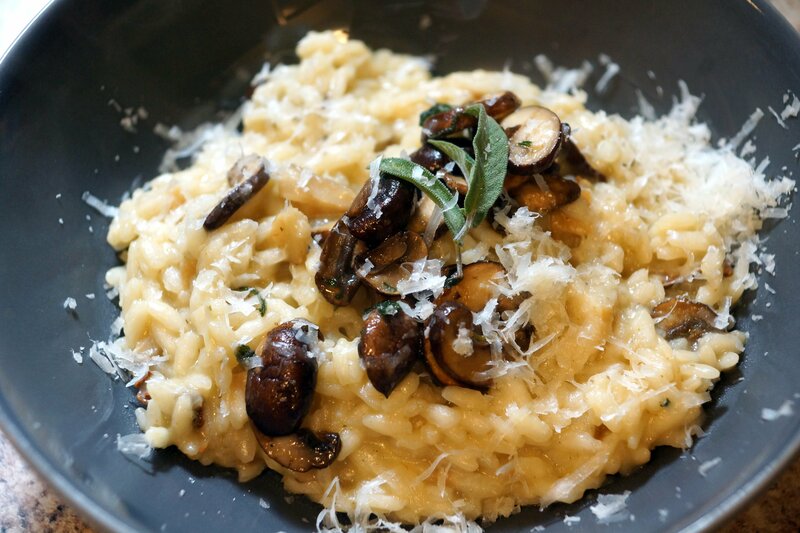 Take your risotto off the heat. 9) Serve with more fresh herbs, cheese and more of those beautiful mushrooms. Previous Can we talk about how good this season of Top Chef is?!? !